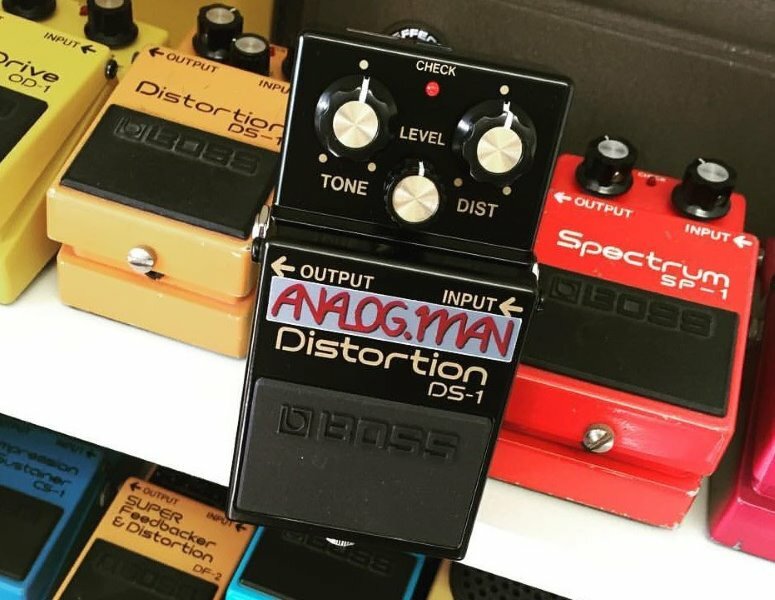 Analog Man modifies the Boss DS-1 distortion into our DS1/Pro specs, with optional MIDRANGE knob to make an awesome sounding distortion pedal. Mike Hermans demonstrates the DS-1/Pro and our MT2 and GE7 mods. We did some testing and found settings which allow one modified pedal to sound like another, this gives you a good idea on which ones have more distortion/volume/brightness. Here is some info on the Ibanez SD-9, a distortion pedal that many people are familiar with. This is just to give you an idea of our pedals if you are familiar with the SD-9. February 2017 - We have the black 40th Anniversary DS-1 in stock! It's the same except the color and the metal thumbscrew. June 2017 - The orange DS1 is now using a tiny circuit board and SMT parts, which we cannot modify. We don't have any orange ones left. We can still mod yours if you send it in. The DS-1/Super mod takes the orange DS-1 distortion pedal, and gives it a professional makeover. The DS-1 can get a lot more distortion than a tube screamer type pedal (like the Yellow Boss SD-1) and make a Fender amp sound like a Marshall after our mods- very full, deep, and rich. The stock Boss DS-1 is fairly thin and buzzy sounding, with a loss in low end. After our mod, the pedal will be a bit louder with all knobs at 12:00, and a much thicker, fuller sound, with no high end tinny buzzing. Just a true distortion sound, a lot less like the sound you get out of a pedal. Our DS-1/Super mod was designed by Ohbayashi San (CAMTAC) and fine-tuned by Analog Mike. It replaces many of the cheap components that Boss uses (in order to make the stock pedal a super deal for the price) with expensive, high grade audio parts. It does not use LEDs in place of the diodes, but a special NOS diode as used in our SILVER mods. We also re-equalized the pedal for a punchier sound without adding more distortion or noise. Our mod actually removes a ton of high frequency noise from the pedal! This mod has been outdone by the PRO mod below, so it's only done now if you have an older DS-1 that has the old style chip that we can't change. The DS-1/Pro mod is the same changes as the Super mod but it pulls out the stock inline chip, and replaces it with a JRC op-amp chip. This chip really improves the tone, giving it more warmth, clarity, and headroom. It's still a DS-1: more distortion, crunchier, and more low end than a tube screamer, and after the mod it sounds awesome even with the DIST knob down all the way. It is a very useful pedal with the DIST knob down for people who don't want too much distortion, or have an amp that is already distorting. It does not have the midrange hump of a tube screamer, it actually has a scooped midrange for more of a modern sound. Most people will use them at high DIST settings, but they sound awesome at low DIST settings too. Play gently and get a clear, clean tone, play harder and the crunch and distortion comes out clear and full! The PRO mod is only available on new style DS-1 pedals which have the power jack attached to the circuit board like the pedal on the left. The chips we use will not fit in the older Japanese or 1st issue Taiwan DS-1 pedals (on the right in the picture). The older version's chips are good sounding anyway, so they sound great with just our SUPER mod. If you have a newer DS-1, or are buying a new one from us, the PRO mod is your best choice for tone. The DS-1 has quite a scooped midrange, especially stock. This is cool for heavier modern sounds but sometimes too thin in the mids for classic distortion sounds, especially through a Fender type amp. After our PRO mod, the lows are better but but it's still quite scooped in the mids. In 2007 we came up with a mod to allow dialing in more mids for more of a classic tube amp sound. We can now add a small MIDRANGE knob under the TONE knob, as a $25 option. It has the exact stock midrange setting and sound at about 10:00. Turning it up gives more midrange and a little more volume. It works along with the TONE control. We can sell you a new DS1/Pro with this option or mod your DS1 pedal. There is no room on the old style DS1 for the midrange pot on top, as they use large pots. But we can add the midrange pot sticking out the back on the side of the power jack, or out of the right side along the input jack. Let us know where you want the knob if you send in an old style DS1. For best sound on the DS1, keep the TONE knob very low. Our midrange knob works great then, allowing you to add in the normal frequencies that sound great with guitar while keeping the annoying high end under control. Another cool setting this mod allows is to run the TONE knob up really high, which is usually terrible. But by turning the MID knob up really high, it smooths out the sound and gives a cool tone, very loud too if needed. Here is a DS1/Pro/Midrange review which ran in Premier Guitar Magazine in October, 2008. 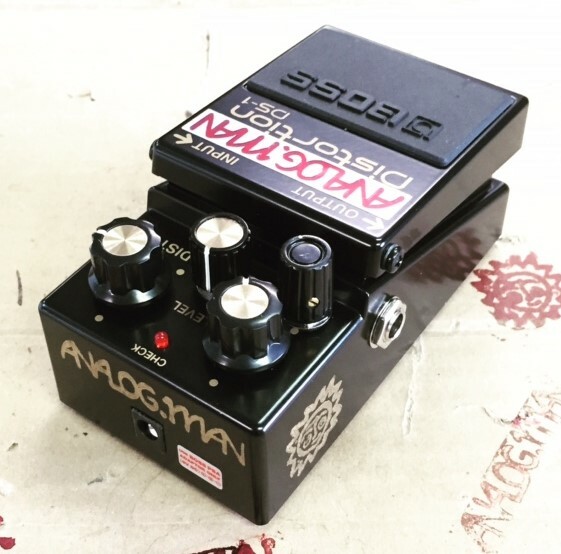 See analogman.com for more info and a link to the mod form to send in your Boss pedal to mod. For many years I have suffered from G.A.S, changing pedals, trying a multitude of distortion/OD pedals. I recently received my AnalogMan DS1 Pro and after only two weeks I have finally found my tone and sound heaven. Whether stand alone or stacked the modded DS1 is one of the best pedals I have ever used. 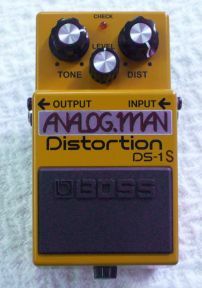 Like many players, a Boss DS-1 was the first distortion I bought. If only Mike was modding gear back then!!! This is one of the best modded ds1 distortion pedals I have ever had, not only is it a great stand alone distortion, but it also makes a great boost/overdrive if placed before preamp, distortion pedals, but also a tone enhancer if placed after distortion pedals. Mikes work is top pro quality. This is my first pedal from mike. I am ready to buy from from Analogman. The shipping was very fast and the customer service was top notch. Thanks again Mike/Anolgman. Thank-you greatly, received the modded DS-1 and after plugging it in, the upgrades sound just as I was hoping. Even better in fact! The pedal has a warm beating heart now. I suspect the sustain is also richer than before, which is incredible. I appreciate you working on this and sending it back so promptly! This pedal is replacing another DS 1 type I used. I liked the other pedal though after a 1 1/2 years the switch failed. Wanted to try this (modding) route to get the quality and great sounds. I had "the works" done - DS 1 pro mod, midrange mod, & a toggle with wiring similar to the pedal I used to use. Frankly the Pro mod is all I needed. It does exactly what I need which is boost signal without distortion when the gain is rolled off. Sounds a bit different than the other pedal which is an adjustment though it's in the ballpark and I swear I love it more and more everytime I play it. The midrange mod is great for versatility though I prefer using the tone knob for mix. Also the toggle has some cool features: "fizzy" at low gain and almost "fuzzy" when turned up. So there you have it: great sounding, incredibly versatile clean boost that can still get into the "Marshall" territory. This is a great pedal now and I am appeciative to the folks at Analogman. Thank you. I got my DS-1 from you back in June (6 months ago), and long after the honeymoon stage has passed, I can say without a doubt that I truly love this pedal. It took bit of tweaking to sit just right with the rest of my rig, but once I found the sweet range, I have absolutely enjoyed it. The mid-control knob is a blessing! In particular, with bridge humbuckers I find the tone to be just the right blend of aggressive and expressive, smooth and chunky. And even with substantial gain, it is respectably quiet. I use a stereo set up, British voiced on one side and US on the other. The end result when using this pedal, especially when the tubes are pushed a bit, is gigantic. Well done! !